ICICI Bank (आईसीआईसीआई बैंक) is a private bank which provides banking services in India. The bank has its headquarters in Mumbai and since it is a private bank, it is important to maintain a balance of Rs 10,000 in a regular saving account in urban branch. In addition to this, if the minimum balance is not maintained then the bank penalizes you for the same. Some people are not aware of this fact and they end up losing certain money because of this and to avoid the further penalty, it is best to close the account. Here is how you can close your ICICI Bank Account. Important Note: Closing ICICI bank account online is not possible, but account closure form can be downloaded from official website. The first step of the process is to withdraw all the money from the bank. You can do this online by visiting the net banking website and transfer balance from ICICI to any other bank account. After transferring all the money from the bank account, save a copy of your debit card, first and the last cheque in the checkbook, account number and customer ID with you. Now you would have to visit the nearest ICICI branch. After visiting the branch, obtain an account closure form or account closure form online. Fill the form and verify the details entered by you. You can leave out the details of balance amount as you have already withdrawn all the money from the bank. Now submit the form along with the checkbook, debit card, and an ID proof. You can retain your passbook with you after it has been canceled by the bank official. Do not forget to obtain the acknowledgment slip from the bank. Once that has been done, the account will then be closed within 10 working days. 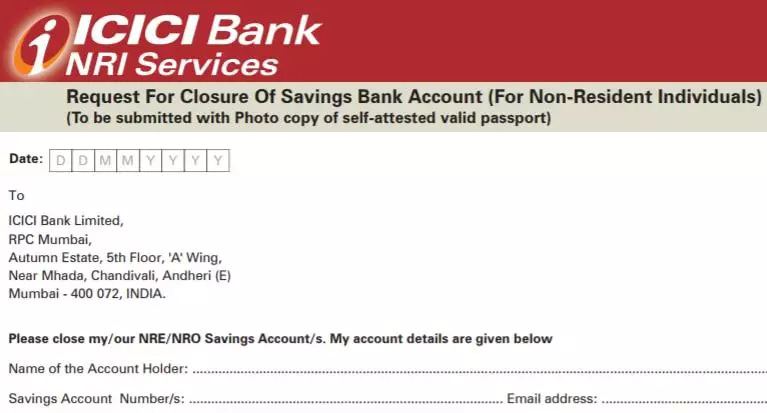 This is how you can close your ICICI Bank Account. If you face any trouble then you can simply call the toll free customer care number on 1800 102 4242 and seek help on the issue that you are facing. Alternatively, you can also register a complaint if the issue is not being resolved for you. I want to write a complaint on icici Bank, salarjung colony branch, Toli Chowki, Hyderabad, Telangana 500008 Woking hours end at 3 pm rather than 4 pm, just bcz it starts office 1 hour early at 9 am. Which causes inconvenience to its customers specifically current account holders mainly business holders. I urge Authority to implemented unified working hours across the branches I.e 10-4, not 9-3. Make account closure online totally without contacting bank take your needed documents in the form of scanning. I want to Close my ICICI bank saving the account. I am 79 years old and neither physically mobile not mentally alert .i have also misplaced my ATM card. Kindly let me know how can I close my bank account.